With my mom here for the holidays it was inevitable that we would have to go shopping. Shopping is my mom’s lifeblood and blood, as they say, is thicker than water. I, being my mother’s daughter, also have that white hot shopping blood cell coursing through my veins, so when she said she needed a new coat rack, I was on board. Besides, shopping is pretty much like breathing for me, if I don’t do it I will die. We headed to one of my guilty pleasures, Ikea. The Seattle Ikea and I go way back. I was there the day it opened. Four of my girlfriends and our month’s old babies loaded up the mini-van and headed south. We were vying to be one of the first 100 people through the door eligible for the free prize give away. Didn’t happen. There were so many people it was like attending a rock concert. Event Staff parking routed us like pigs to the slaughter. But if this was a slaughter house, kill me now. I was in heaven. As new mom, with a new house to furnish and no budget, Ikea was a godsend. I remember my first purchase that day. I bought a small three drawer dresser for $29.99. I used the crap out of that sucker. I think it may have been put in every room in my house for years. I finally had to give it up 12 years later when a new puppy chewed on the corner. Even then I couldn’t let it go. It ended up in the garage storing craft supplies for another 5 years. Ikea isn’t what most people think of when they think quality furniture. But it’s just so darned affordable and well designed. And when you are married to the Ikea master assembler, putting everything together isn’t a concern. So while I do advocate investing in quality pieces, there is still a place in my heart for Ikea. 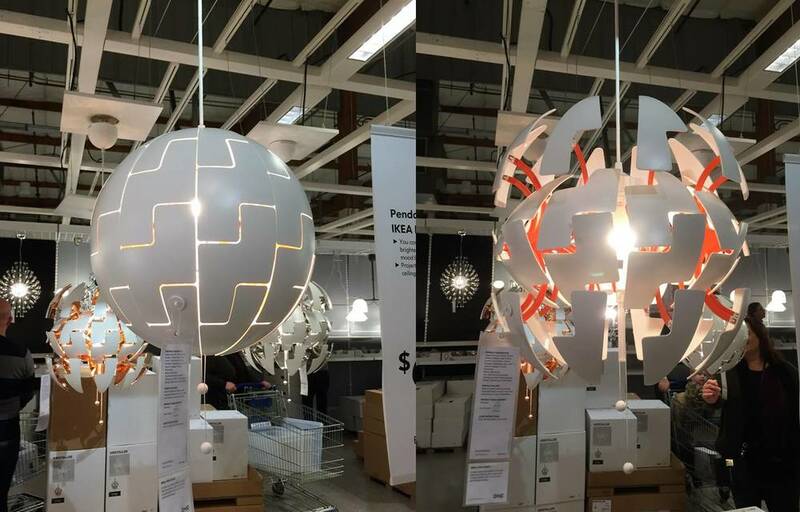 One place that Ikea shines is with lighting (pun intended). 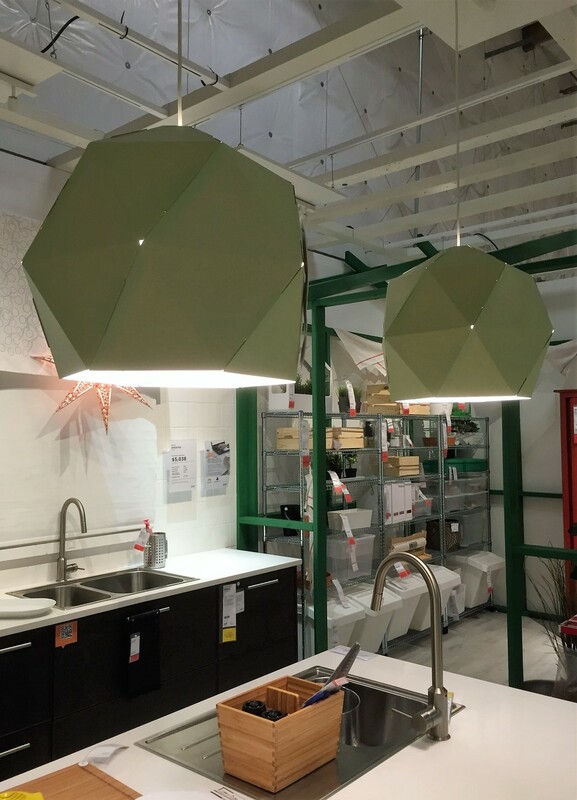 I wanted to share with you a few examples of really cool lighting I spotted in the store on my recent trip. This fun and funky pendant reminds me of something out of Star Wars. I see it in a playroom or a casual eating area. It comes in several colors including a new white/copper combination that is a bit more sophisticated and would be great in multiples. At first glance, it may look like wadded up tissue paper, but the wire edges let you manipulate the shade into the perfect configuration for your space. The softness it brings would be great as a chandelier in a bedroom filled with neutrals and texture. $4.99? Are you kidding me? If you're like me and like to change up your decor, this lamp shade is made for you. At that price, these could simply be party decorations! There is also a larger version in dark blue for only $6.99. A word of warning if you're heading down to IKEA in Seattle, they are building a new store next to the current space (SQUEAL!!) and parking is crazy! Bring your patience or give me a call and I'll head down there for you!